I won my seat into the WSOP 2005 main event yesterday night! I am still very excited about that. Pokerstars is offering a weekly event, a $615+35 multi-table qualifier. Yesterday 301 players entered and 16 seats+$1,000+hotel accomodation were available. 30 players were “in the money” giving them back $650 for a free roll into the next one and the 31th spot would payout $15 for a total desaster. Right on I was surprised how slow this tourney started and that pace almost never changed. We started with a nice 2,500 stack and slow levels so this promised to be a long tournament. 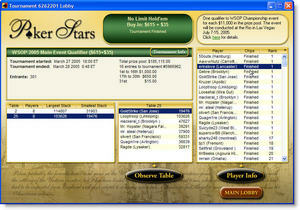 Actually this was my first “big buy-in” online tournament that came kind of close to the real thing. No fast and furious action, players taking their time, no many rubbish hands and a very concentrated atmosphere. Two hours before I had played stars $500,000 guaranteed tournament with a $530 buy-in and that was a different thing (I lost my chips there with KK against 33 and AK against A7). 2) The best hand help up. When the play got more into a blind attacking mode I decided to steal some blinds also and holding KQo in middle position the sport just seemed right in a ultra tight game. The blinds were already 600/1200 with 75 ante and I had 32,000 left. I raised it to 3,600 and only the button called. The pot was now 9,600 and the flop came 6-4-Q with two hearts, giving me the top pair with decent kicker. I bet out 6,000 and was raised to 12,000! I called instantly. The turn was the 3 of hearts and I checked, not knowing where I stood in the hand. The button moved all-in for his last 7k. I called. He had QJo for top pair with not-so-good kicker. The river brought no help, actually it helped my bringing a K for kings-up and I again was in the chip lead with nearly 60k. From there on I played no more hand and just waited to get into the money and finally into the WSOP as I was pretty scared about any kind of accident that seem to happen so often in the last months when it gets to the important spots. I throwed everything including QQ away, sitting to the rigth of the very agressive chip leader, which finally ended the day by throwing out the bubble boy with 53o against ATo. He had a lot of chips and played his big stack very well, putting preasure on everybody. Made no sense for me to mess around there, holding on to 4th or 5th chip position the whole time even while throwing everything away. It worked this time and made it to the last 16, getting a $10,000 valued seat into the WSOP 2005, $1,000 in cash and 7 night of hotel acomodation if I wear pokerstars logo wear which I play to do, looking like an online qualifier (which I am actually, yes!!!) in the main event could not hurt, only help as I see it. Now we have the task of getting Katja into the main event also left, which we will start to try when we return from vegas in april. Folks, this feels sooooo good!